No. 5, Lorong Kasawari 4, Taman Eng Ann, 41150 Klang, Selangor, Malaysia. Technicken Industrial (M) Sdn. Bhd. was established in 1997 to offer professional sales, service and spare parts (3S Centre). 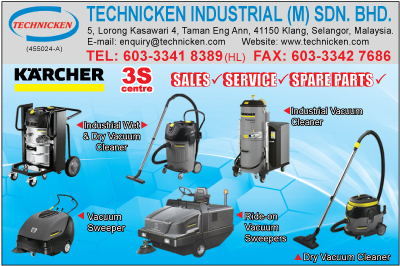 Technicken specializes in high quality imported and exported full range of cleaning equipments and cleaning chemicals to meet the unique requirement of the international business environment. We are now able cater for major cleaning contractors, hotels, restaurants, complexes, manufacturing and constructions.